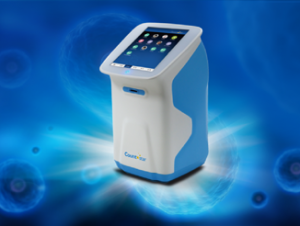 Trypan Blue BioApp : Obtain cell count, viability and concentration estimations based on trypan blue staining using a disposable consumable. AO/PI Viability BioApp : Run two fluorescence color assays in disposable consumable to determine the percentages of live, dead cells and concentration in the presents of debris and unwanted nonnucleated cell types including red blood cells. GFP transfection : The green fluorescent protein (GFP) exhibits bright green fluorescence when exposed to light in the blue to ultraviolet range. This protocol can analyze counting and percentage of GFP.